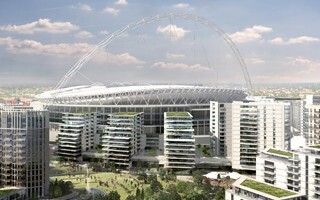 The image of Wembley National Stadium is changing almost on a daily basis. The iconic building is slowly getting hidden between newly-built residential blocks, even if its arch still protrudes and is seen from afar. 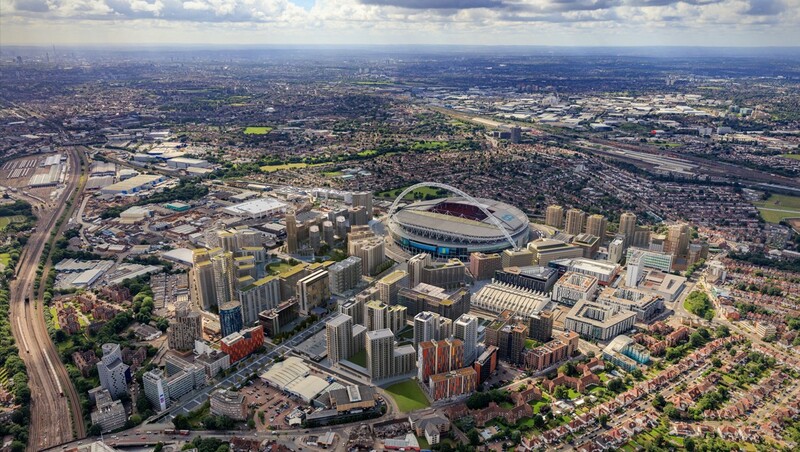 While transformation of its dated surroundings has been ongoing for a few years now, only currently the stadium itself is beginning to disappear from sight partly, at least from the perspective of fans entering from the northern Wembley Way (officially Olympic Way). 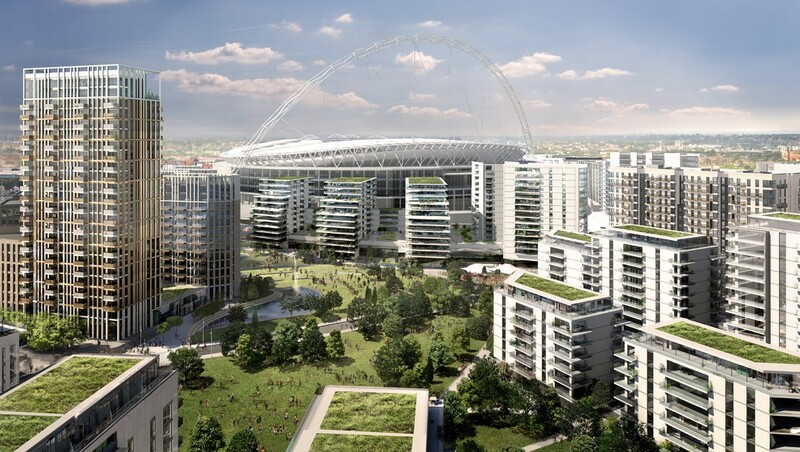 Changes are the outcome of W03 and E01/E02, which stands for two projects being part of Wembley Park, the massive redevelopment scheme carried out under developer Quintain. Eventually as many as 20,000 people are expected to make the precinct their home (5,000 individual apartments are planned). The two aforementioned projects will alone supply almost 1,000 apartments. W03, north-west of the stadium, will have 15 floors and provide 340 apartments for rent. Two blocks of E01/02 will vary between 12 and 15 floors and deliver 633 flats. They should be ready in 2019, having seen groundbreaking in 2017. The flats are being built on what used to be ground-level parking. 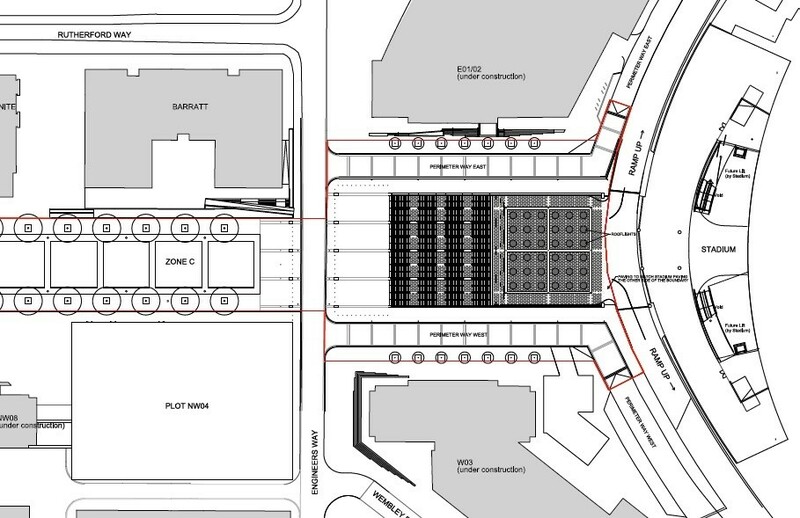 To offset the parking places, additional multi-level parking will be built, with 3,000 places. A symbolic change has also been announced in recent days. The single last piece remaining of the old stadium's infrastructure is about to disappear. When reconstructed over a decade back, Wembley retained the northern ramp leading fans from Wembley Way to the old stadium. Built in 1970s (and seen below), the ramp is now set to be replaced by vast stairs, accompanied by 4 elevators for wheelchair users.